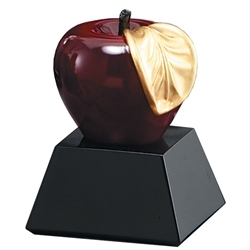 4.75" Apple "Teacher Appreciation" Trophy. The wholesome apple sometimes is used to symbolize health and wellness but for generations past, present and future, it's an expression of respect, gratitude and love for those special teachers who've helped guide us, shape us and make a difference in our lives. Show how much you appreciate a teacher who has made an impact in your life with this beautiful award. These apple trophies are made of resin.